During the Colonial days, taverns were to the citizens what the internet is today. They were a place to check in on what was going on in town. A place to learn about the weather, hear the latest news, or play a quick game with friends. All while grabbing a beer, glass of rum, or some food. Taverns were an essential component to the community as they were a place where local governments organized, formed and conducted business. Because of this, many taverns hold an important role in the history of the United States, like the Windsor tavern in Vermont. Now called The Constitution House, The Windsor tavern is where a group or representatives met in 1777 to adopt the name Vermont and to also create the states constitution. Fourteen years after the crafting of the constitution, Vermont became the 14th state in the union, and our sampling state of the week. When I mention to friends that lived in the state that this week was Vermont, the first thing they say is, “what beer is from Vermont other than Catamount?” And the answer to that is, there are a few breweries and Catamount isn’t any of them! In fact, the Catamount brewery closed down in 2000 and the building is now owned an operated by Harpoon. One of the easily accessible breweries (at least in my area) from Vermont is Otter Creek. A few months back, one of my local beer stores hosted a craft beer night, and while there I had a few people tell me that I had to check out the Otter Creek Black IPA, it was good stuff. But this week I went with their staple, easy to find Copper Ale. In the wild world of beer, there are generally two major classifications, Ales and Lagers, and these classifications are established by the type of yeast used to make the beer, either top-fermenting (Ales) or bottom fermenting (Lagers). However, like anything else, the details are much more complex and placing all beer into two large classification buckets doesn’t come close to addressing all of the styles and creations that are coming out of the craft breweries today. Classification of beer into styles based on fermentation is a relativity new phenomena. And with Ales, this is no different. For a style of beer that is considered older than England, The Oxford Companion to Beer states that the term “ale” only began to become synonymous with top-fermented beers generally as late as the 1980s. 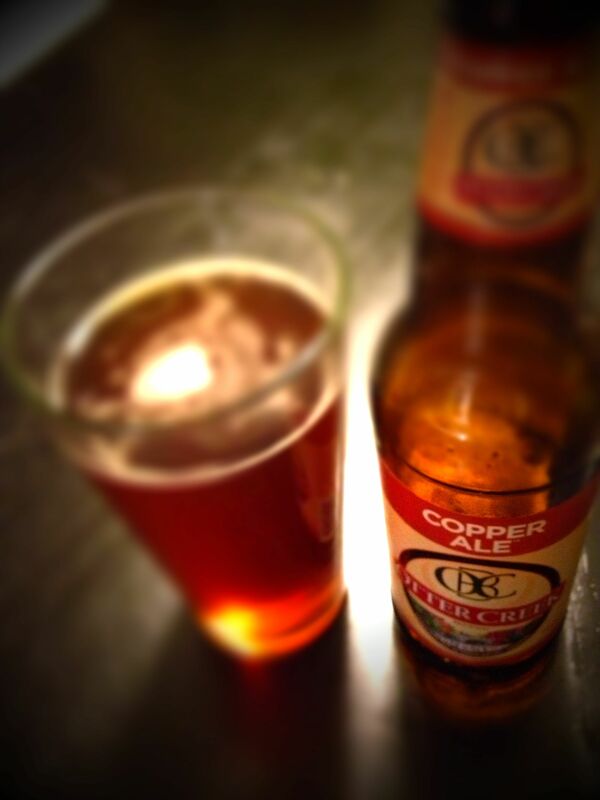 Copper Ale: This is an ale which is aged in oak casks to obtain its beautiful copper color and its unique wine-like taste. Primarily produced in Belgium. Since the Otter Creek website is under construction, I was not able to verify if this beer was aged in a oak cask like the definition suggests. However I did not get any unique wine-like taste from the beer. In the glass, this beer has a nice copper color. As has been typical with most of the six-pack bottled beers sampled on this adventure, there was little to no head. This beer is good, but there isn’t anything special about it. The smell was slightly fruity, but it didn’t have any unique characteristics that made it easy to refer to. That taste was the same. It wasn’t boring like a big, mass produced beer, but it also didn’t have any distinguishing characteristics that have been observed in other beer this year. Overall, this is a beer I will buy again, but if you are looking for something that has unique character, this isn’t it. 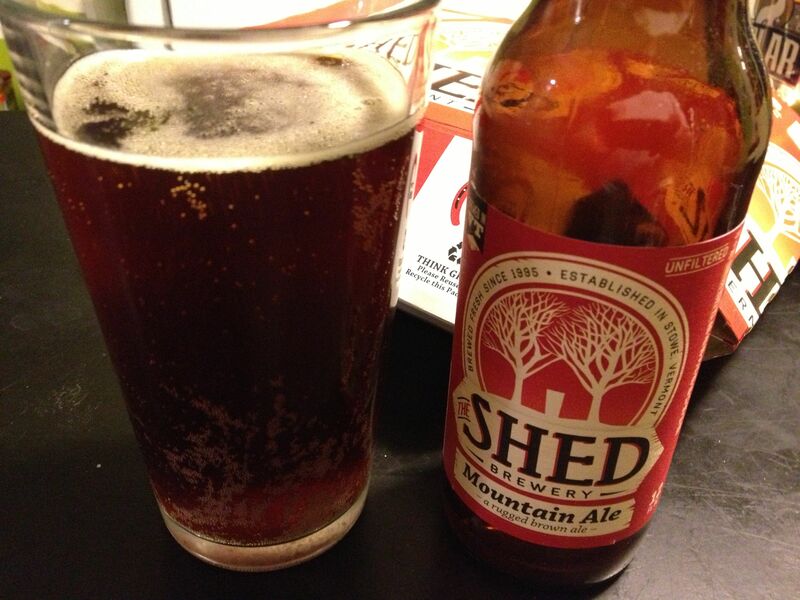 Other beer from Vermont this week is another ale from The Shed which I just discovered is now part of Otter Creek. The beer, called Mountain Ale is a typical brown ale, in taste and color. Brown Ales are a style that I have a hard time extracting descriptives for. They seem to rely more on the malt to carry their flavor, and I appear to be better at discerning the hops flavors. I think because of that I have spent more time this week with the Mountain Ale and the previous Copper Ale, trying to develop my tasting for this different malt styles. So, as I develop my tasting palate for a malt, I would place the Mountain Ale in the same category as the Copper Ale. I like it, I will go back to it, but at the moment, I am struggling to better describe these styles of beer. In the late 1990s, there was a popular sitcom on television. While this show took place in Ohio, not Vermont, it did prominently feature a tavern called the Warsaw tavern. That show was The Drew Carey Show. One of the plot lines from the show was the formation of a brewery in the garage of the central character, Drew Carey. The beer the brewed was called Buzz Beer and it was unique in that it was brewed with coffee. With a slogan of “Stay up and get drunk all over again,” the idea of a coffee beer hybrid provided for great comedy. Now, just nine years after the end of the show, actual coffee beer seems to be trending. And continuing with that trend, we will wrap up this week with another coffee beer (I think that makes 4 for the year now?). The Coffee Stout from Long Trail was a nice find. A part of their brew master series, this was not on my radar when was out getting beer for this week. Each coffee beer we have tried this year have been fun, and each had a unique characteristic, like the pepper aftertaste of the Wake ‘N Bake. 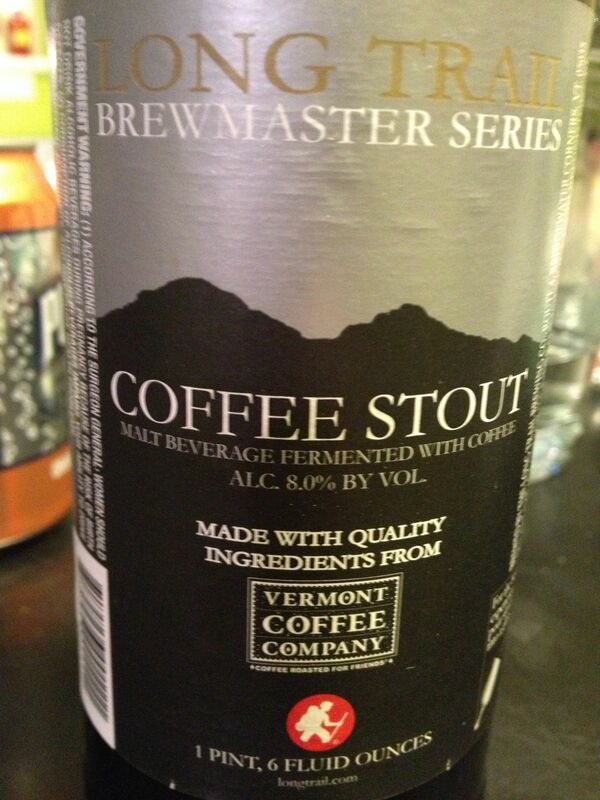 To date, I think the overall favorite was the coffee beer from Berkshire Brewery in Massachusetts. Well, there is a new king in town. This coffee stout was great. The mix of coffee and stout was perfect, with neither stealing the show. According to a story earlier this year in the WSJ about coffee beer, getting the coffee to beer ratio is a critical factor in the success of this brew. I would say Long Trail nailed it. Get yourself a bottle of this beer as soon as you can, it is worth it. But don’t rely on this beer to help you “stay up and get drunk all over,” because coffee beer has less caffeine than a cup of decaf. Last night while chatting over the Coffee Stout, Joel said it best The best beer so far have come from big brown bottles. While we have had some great stuff from the traditional six pack sized bottle, and cans are all the rage this year, it has been the growlers and the 22 ounce bottles that have left us excited at the end of most weeks. We will see how that plays out for the rest of the year, but at the moment, it is something to think about the next time you are in the market to try something new and exciting.